06.16.2005 - This is a standard attic decontamination job. This attic was infested with rodents - both Roof Rats and Eastern Gray Squirrels. I trapped and removed all of the animals and indentified and permanently sealed shut all of the entry points. However, the attic remained vulnerable, because the rodents had left behind their scent, and the entire border of the house was vulnerable. The rats and squirrels had chewed their way into the wooden fascia board and right down into gaps in the wooden roof that lay below barrel tiles. It's important to remember that rodents communicate via the smell of their urine and pheromones. This rodent scent remained in the attic, and acted as an attractant to other rodents. Even though I removed all of the rodents inside of the attic, they left their scent behind, and new rodents were likely to smell it and attempt to chew their way into the house. Thus, I felt it important to remove the scent by decontaminating and deodorizing the attic. I use special cleaners, including an enzyme-based cleaner that eliminates any biohazard organic waste from animals, including droppings and urine. I use the electric powered atomizer as shown in the above photo, which creates a fine mist that flows through the whole attic and gets every nook and cranny, for 100% coverage and cleanup. To protect myself against insulation fibers and animal biohazard, I wear a disposable Tyvek suit and I wear the respirator mask, as shown above. 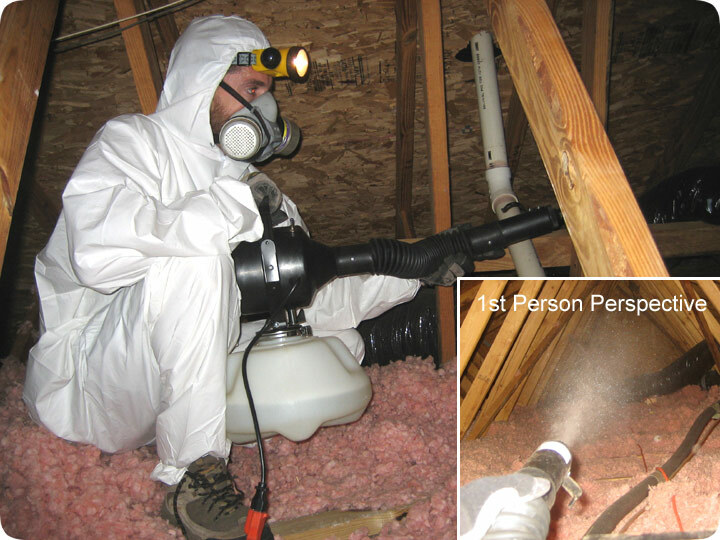 This attic fogging destroys the rodent pheromone scent, and eliminates the odor that would have attracted new rodents to the chew their way into the attic. Leptosporous - Lepto, short for leptospirosis, is a bacterial infection in mammals that affects the kidneys. It harbors in stagnant water and can be transmitted through contact with animal waste, including waste in your attic. Leptospirosis is very common in many parts of the country. Dogs are frequently vaccinated for this disease. It generally does not exhibit signs in canines until the illness has destroyed too much of the kidney function to be reversible. There are multiple strains of this disease, and the vaccination does not cover them all. Unfortunately, most people who contract leptospirosis get it from their pet. Raccoons are another species known to carry leptospirosis. Families in the country often worry about raccoons urinating on wood to be burned. This wood is then brought into the home where cats, dogs, and children can come in contact with it. Symptoms in people include those similar to the flu. Muscle weakness, fever, chills, and coughing are all common. More progressed versions of this disease will show with enlarged lymph nodes, bone pain, and a swollen spleen. The disease can be treated with antibiotics, but most cases require hospitalization. Because of the flu-like symptoms of leptospirosis, many people go undiagnosed for a long period of time which is why many cases progress to serious levels.